The course is all about really letting go and painting from the heart and not the mind; reacting rather than analysing – with particular reference to de Kooning who has been a major influence on Paul’s work. Students will have the opportunity to develop their own experimental approach under Paul’s inspiring guidance. We will begin with a simple still-life and work on different ways to respond to and translate this onto canvas. The emphasis will be on broad ideas, gestural brush strokes and ignoring the minutiae. Paul will demonstrate several techniques for looking at a subject with fresh eyes as well as introducing experimental painting methods using a range of media. Expect this to be a fun and challenging two days where you will really engage with paint and surface with a hugely supportive and encouraging tutor. Students are welcome to paint outdoors in the glorious garden and Sussex countryside. Suitable for all levels. 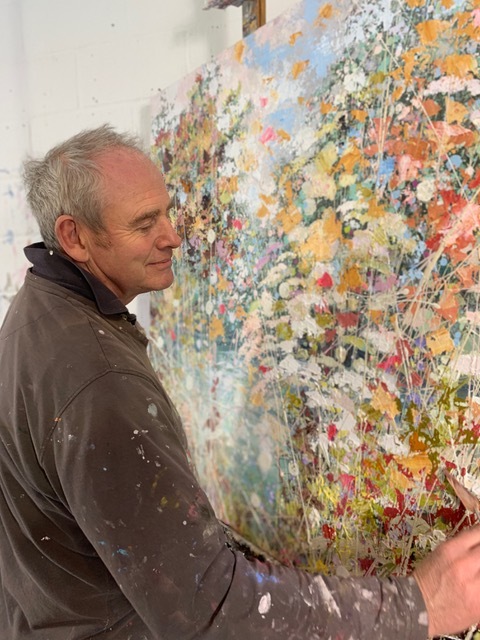 Paul is an acclaimed artist of many years experience who has exhibited throughout the UK and the Far East. We are very lucky to have persuaded him to run this course. www.paultreasurepaintings.co.uk. Price: £225. To include primed painting boards and a delicious lunch.